What Is A Red Tag Furnace? With any household the safety of the residents is of huge importance. A reg tagged furnace indicates that the current furnace installed in the home is unsafe for operation. It gets its name from the colour of the tag placed on the furnace by the diagnosing technician indicating that the heater is no longer usable with either a replacement or repair. To be clear, the HVAC technician who is examining the furnace does not have a choice but to place a red tag on the furnace if it is indeed dangerous in any way to operate. If a technician did not place a red tag on a unit he or she knew was dangerous he or she would likely lose their license. AirZone adheres to the highest ethical standards. We only red tag a furnace when we are required to do so legally. Our expertise allows us to diagnose and solve issues that may not require a full unit replacement. If a retrofit is required, we are also able to provide a competitive quote backed by our quality guarantee. 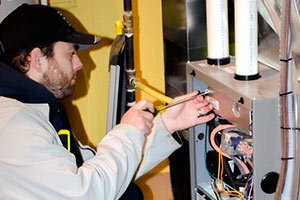 If your furnace has been red tagged in Ottawa or the Ottawa Valley (as far as Deep River) we will offer you a FREE second opinion. Simply give our office a call or fill out one of our request a quote forms and mention that your furnace has been red tagged and you would like a free second opinion. Was The Technician Correct In Red Tagging My Furnace? The technician is looking to sell the customer a new furnace and is using a red tag to force a decision. The technicians expertise is limited and they are unaware if the unit is safe or not to operate. This is the more common situation. Regardless of the reason for a red tag the customer always has the right to get a second opinion as to what is required (either repair or replacement). A second HVAC dealer can remove a red tag placed by another company or technician.